Do you remember my pretty buffalo check chairs? The fabric was exactly what I had been looking for and I couldn’t believe my luck in finding the perfect chairs at an antique mall. 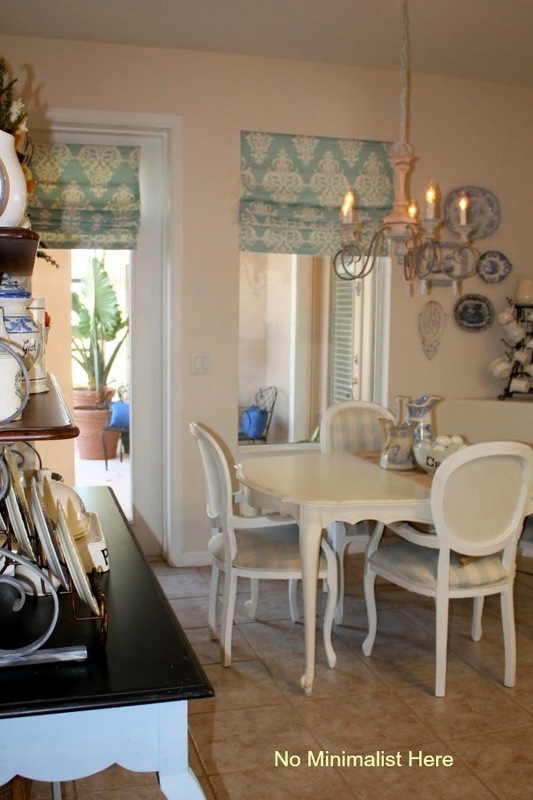 I painted the chairs white and loved them even more. Accidents happen. There was a big spill and the fabric was ruined on two of the chairs. I tried cleaning them with my Little Green Machine and it made it even worse. Days were spent hunting on-line for the exact same buffalo check in hope that the two damaged chairs could be reupholstered. I ordered the Powder Blue Lyme fabric from The fabric company and thought problem solved. No, this would be way too easy! The upholstery on the chairs had faded and the new fabric didn’t match. Back to square one…. Here are just two of the chairs waiting to go to the upholsterer where they are getting a new look. Be back soon to share the changes. 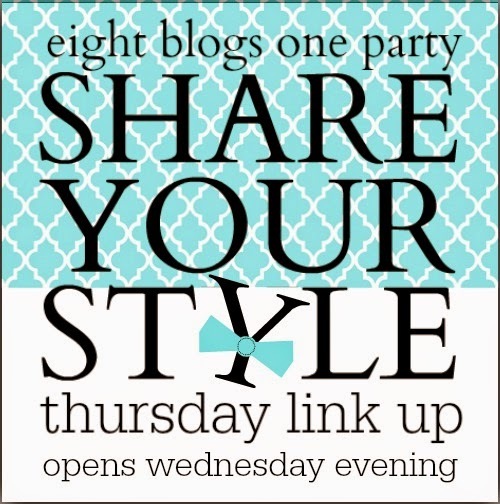 I would love for you to join me for the Share Your Style party starting Wednesday evenings. Thanks for dropping by and have a great week! Oh, no! I'm so sorry to hear about your beautiful chairs! Well, I'm sure they'll still be beautiful! Now don't fret over spilled milk or whatever it was. Oh I hate to hear that your chairs got ruined! I hope the new upholstery will make you smile again. I would've probably shed a few tears over that if it was me. SO sorry Sherry. I'm sure it will still work out in the end. Good luck! How sickening! I hope the accident turns out for the better! LOVE that great Buffalo Check, Sherry, but I know they'll become even more beautiful in their "next life"!! I know they will turn out beautiful, Sherry! Oh, NO! I love those chairs, Sherry! 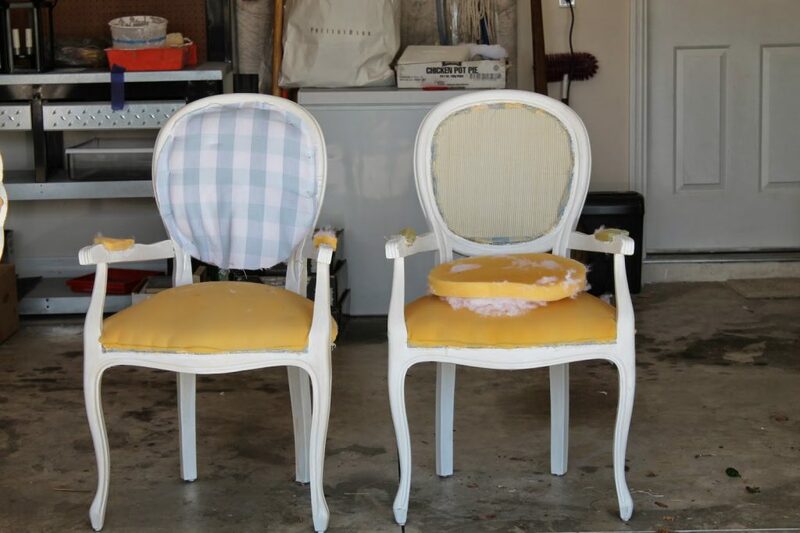 Thankfully you were able to find the same fabric, although two of the chairs' fabric looks more faded. I'm sure, over time, they will, look the same and you won't even notice. I'm sure you must have just felt sick when you saw the fabric was ruined. Oh no!…sorry that the fabric you ordered did not work out…I so loved the fabric…however, I know that you will find another one and you will fall in love with…and we too! I'm wouldn't tell you sorry because isn't it just an opportunity to re-do them? I know you love to change things up as much as the rest of us. There's a little devil in me saying "spill something" right now! Oh I love those chairs. Can't wait to see what you do. I love those chairs, too! My dining room chairs were reupholstered by my husband almost 20 years ago. At the time I loved the fabric. Now, not so much! 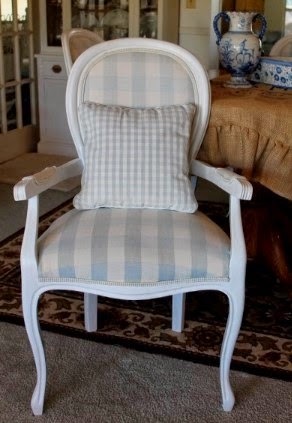 I just ordered ruffled floursack chair seat covers because I couldn't stand it anymore! I'm sure you'll love your chairs once again after they've been "renewed." Good luck! Oh that kind of thing just makes your stomach go in knots! Hopefully you will love the new fabric just as much! I can't wait to see the finished results. Oh no! I'm so sorry! I adore the Buffalo check too, but I know you have something wonderful in store for them. I know they will be beautiful again! Eeeek, I'm so sorry about the accident. Your chairs have such great bones, they will be perfect with the new fabric. I love your chairs! Hopefully you'll be able to find the perfect fabric to replace the stained chairs. Looks like a lot of work, but well worth the hunt and effort. Thanks Sherry for sharing at Vintage Inspiration Party. Sherry, thank you for spearheading this party and rounding up so many great hosts. I really liked those chairs too, but knowing you, you'll find something even more fabulous next time around. What a mess! Good luck with the new upholstery. I know how you feel. At Christmas someone knocked over a candle on my favorite chair and I have yet to get all the wax off. I'm so sorry about your chairs. They are just gorgeous and I love that print!